Whether you choose burial or cremation, there is also another type of keepsake memento a family may choose to remember their loved one with. We offer all of our families the option of having their loved one's fingerprint (or footprint for an infant) taken before the final disposition. We keep these prints on file forever. There is a company that makes memorial jewelry from these prints. They are called Thumbies. 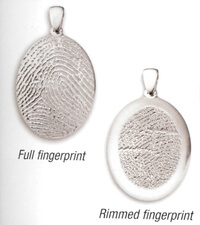 The thumbprint may be etched onto many objects, both sterling silver or gold, including charms for a necklace or a bracelet, various types of rings, key fobs, earrings, cuff links or tie tacs, dog tags, money clip and many other items. Prices vary from week to week, due to the market value on the day of the order. You may go to www.meadowhillco.com to view the online catalog to see all of the options that are provided. We also have these catalogs in our office, if you would like one. You can contact the funeral home at 563-322-4438 to place an order. Ask for Theresa.